A key feature of my teaching and work with educators is to foster a form of what I regard as techno–resilience and a capacity for technology leadership that can help hurdle some of the financial and emotional barriers that persist within the teaching profession. The fact is, many educators still cite the same barriers that existed more than 20 years ago when I was teaching with technology in the classroom! Much of what I do is inherently embedded in my philosophy and is revealed in the form of cultivating a mindset that values the need for a connected, relevant, and inspiring curriculum that embraces technology at some level. Notable is that technology does not have to be at the centre of it all, but always in the consciousness. For example, at the onset of a typical class or work shop, I provide an opportunity to collaboratively explore a cost-effective technology that I have picked up at a second-hand store or on sale; this is called “Rob’s Techno Inspirational Moment.” The range of technologies explored has included digital voice recorders, digital cameras, USB digital drum pads, iPods, digital photo frames, and a variety of relatively cost-effective USB driven devises and freeware programs. Not surprising to me, this exercise in group collaboration (I call these ‘collaboratories’) with a focus on pedagogy and discovery that challenges the educators to reflect upon and connect with their classroom experiences, almost always reveals a myriad of creative cross-curricular ideas for how the given technology can be used across a range of grade levels. The intent is also to demonstrate that technology enhanced learning goes beyond the use of SMART Boards (a common misconception that persisted with many of my former students). This practice also models the type of collaboration and creativity that is required in order for a technology to afford itself; it is part of the teaching and workshop process that I have devised for shaping a skill set and the appropriate attitude required for adapting technology within the disparate, jagged, and rocky teaching landscape that currently exists in Ontario schools specific to technology enhanced learning. 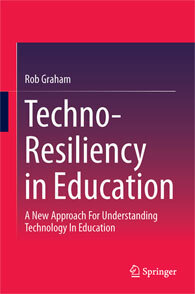 This entry was tagged ed-tech, educational technology, resilience. Bookmark the permalink.